My six year old's favorite lunch for me to pack him is an English Muffin pizza. Its just a whole grain muffin, pizza sauce and mozzarella cheese and he absolutely loves it. Then one day while staring into the fridge pondering what to have for lunch myself, I had an epiphany! I could make a gourmet mini pizza just for me. While I do love a pizza loaded with sauce, cheese and maybe some eggplant, I also have become a fan of a white pizza topped with broccoli and garlic. Oh so yummy. So I threw one together myself for a quick and healthy lunch and it was quite yummy. 1. 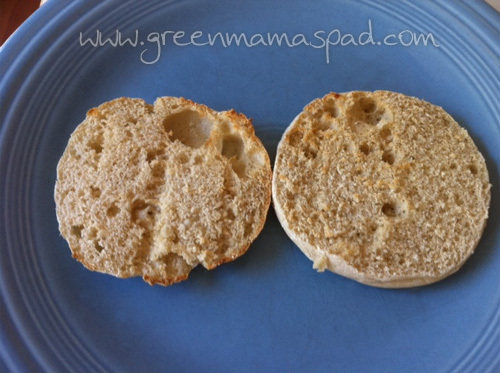 Split and lightly toast your English Muffin. 2. 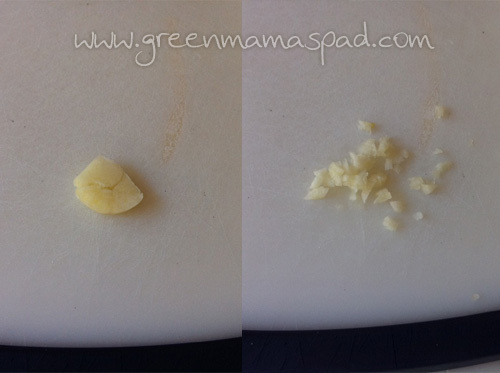 Finely chop some fresh garlic. 3. 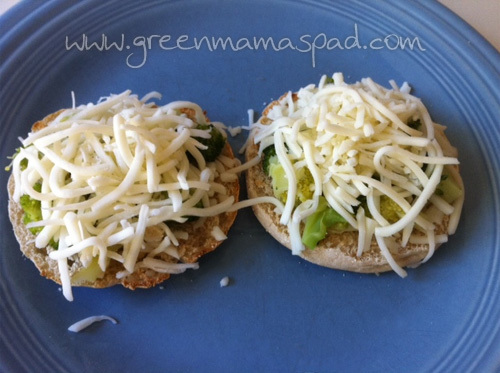 Sprinkle a thin layer of mozzarella over the English Muffin. Add broccoli, a generous amount of chhese and top with garlic. Place in toaster oven or regular oven and broil until cheese is completely melted. 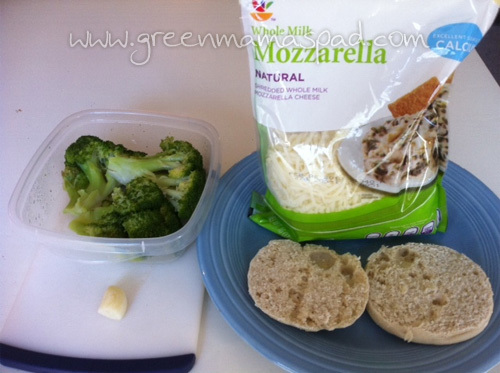 Gather your four ingredients: English Muffin, mozzarella cheese, broccoli and garlic. I am not a fan of frozen broccoli but you certainly can use that (thawed) if you prefer. Lightly toast the English Muffin. This will help to give it a nice crunch. While that is toasting, finely chop your garlic. I started with the slice of garlic on the left and chopped till I got to the size on the right. Don't ask for a measurement, I don't have one. 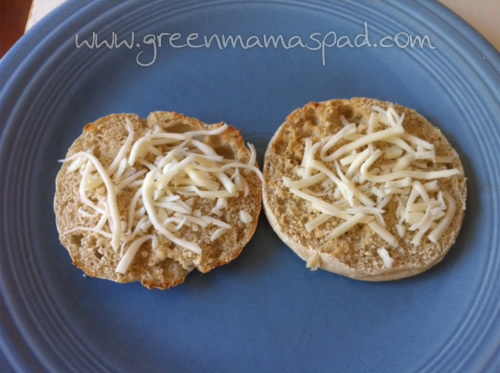 Add a thin layer of cheese to the English Muffin. 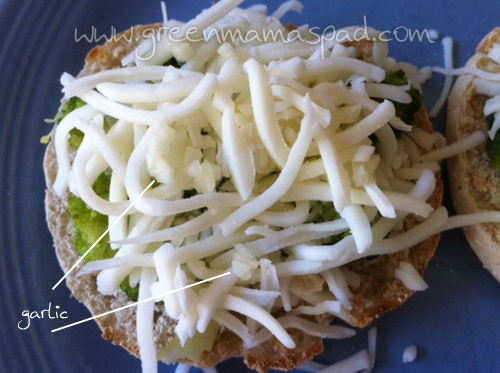 Place the desired amount of broccoli on top of the cheese. I packed mine with as much broccoli as I could fit. Pile on some more cheese. Add more than you think you should because when it melts down it seems like it is less. The last thing I add is the garlic. I like for it to be on top so its get a little toasted by the broiler. 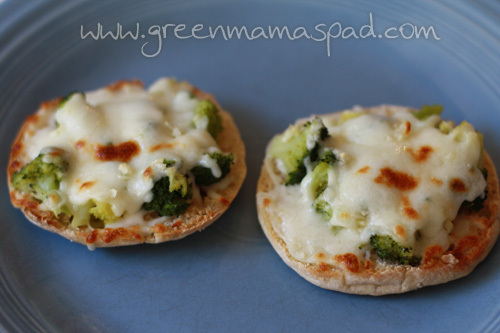 Place the mini pizzas in the oven or toaster oven on broil until the cheese is completely melted. 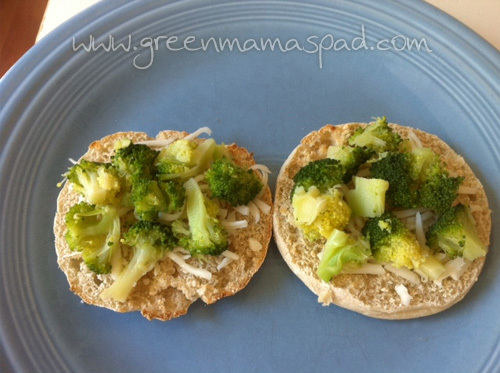 Let cool for a few minutes before biting into this healthy and yummy snack or lunch! Those looks fabulous. I may have to try this. This looks so simple and yet good. 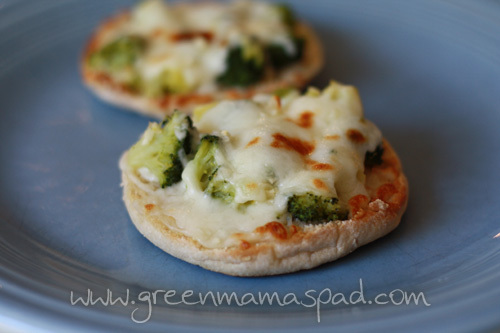 I love english muffin pizzas but I have never thought to add garlic or broccoli. I'm so excited to try it! OH yummy! That looks so good and easy! These look really good and easy.